The Grand Rapids Chair Company is a manufacturer of commercial chairs and tables. While their largest customer segment is fast-casual restaurant chains, they supply nearly every category from casual to fine dining, college cafeterias, hotel venues and more. Their business spans all across the US and beyond, so it's highly likely you've experienced one of their products while sitting down at places like your local Wendy's or Whole Foods Marketplace. The Grand Rapids Chair Company came to ManoByte in 2016 after a relationship with another inbound marketing agency hadn’t met their expectations. Although their experience left them somewhat skeptical of an agency relationship, they were determined to leverage their purchase of HubSpot to its utmost potential and knew they needed an experienced team of HubSpot professionals to help them achieve what they knew was possible, so they partnered with ManoByte. When we first partnered together, the Grand Rapids Chair marketing team had somewhat limited HubSpot knowledge, and they didn't know exactly who their customer was. They had a very reactive approach to their sales efforts, fulfilling the orders to anyone who submitted one, not really understanding how they could meet those opportunities earlier and close business more efficiently when they came in. They also wanted to find ways to attract the right kind of traffic to their site so that they were engaging with people who were most likely to become potential customers. ManoByte knew the vast opportunity that GRC had before them from an inbound marketing and sales perspective. We immediately worked with GRC's marketing and sales teams to create buyer personas that provided a clearer picture of their customers. These personas still serve as the baseline for all of our inbound marketing efforts for Grand Rapids Chair. However, for this inbound growth entry, we'd like to focus on a couple of key areas where we found we used more creative and customized strategies that produced some more notable inbound marketing and sales growth for GRC. In 2017, since an inbound marketing strategy was now up and running, GRC and ManoByte determined it was time to work on enabling their sales team. The number one priority of these efforts was to help their sales representatives establish more control over the sales processes to enhance efficiency and structure, and ultimately, to focus on creating a more productive environment. We began our multi-phased process by defining their sales strategy, including the deal stages, activities, lead scoring, and clearly defined success metrics. We also worked in this phase to define their biggest sales challenges, their overall business sales goals, updated persona information, and benchmarked their sales data. That helped us to create a clear path for the process leading to sales success. We then moved to the next phase, which was educating their sales representatives and creating a content marketing plan for their sales process. We held a training day with their representatives to explain the sales enablement process, how it works and how they can better utilize HubSpot to save time, enhance productivity, and close more business. And finally, we implemented their solution with email templates, workflows and additional supporting sales content created just for the GRC sales representatives. We also created custom reports tailored to their unique sales process. 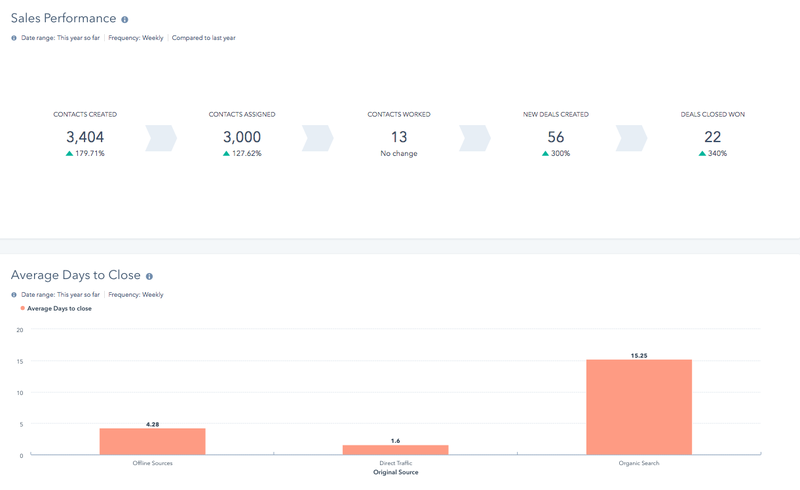 As you can see by the charts below, the team has been utilizing this solution for over a year, and they have accomplished their goal of having greater visibility and control of their sales processes. 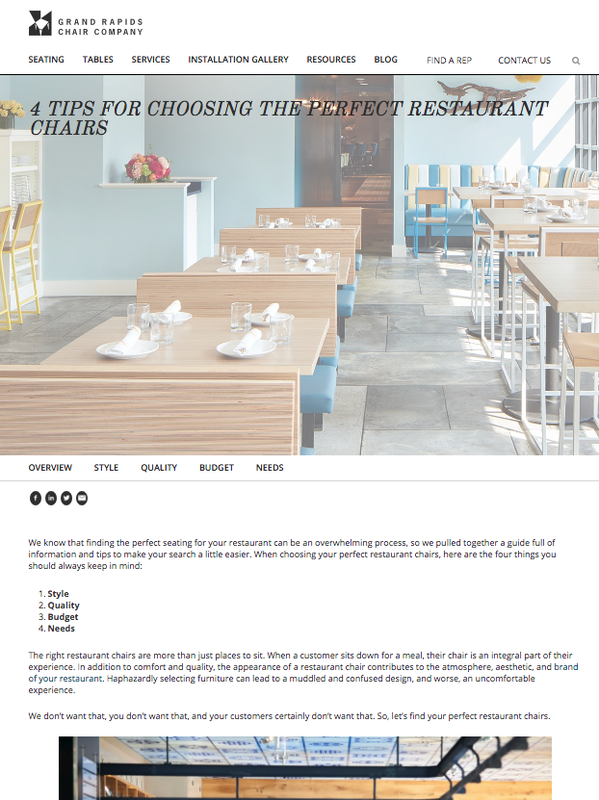 Because Grand Rapids Chair has a deep desire to connect with the right audience, we suggested that we implement a new content strategy approach to their inbound efforts. We advised doing this through HubSpot's new content strategy tool and the concept of pillar content. They were eager to get on board and see if they would see any traffic increases and contact conversions due to the changes. We held a strategy discussion to determine what phrases their customers are most searching online. 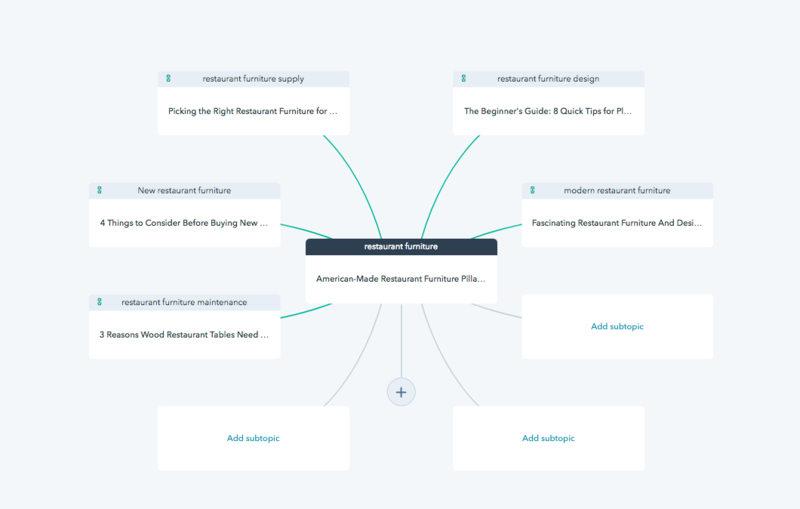 After determining that "restaurant furniture" and "restaurant chairs" would be our first two core topics, we got to work creating the elements to put it into action. We began by developing a customized page template with a variety of sections with clickable areas where content could be added. Our writers then met to determine what content could be developed for the primary terms, as well as the supporting content for the subtopic links in the clusters. 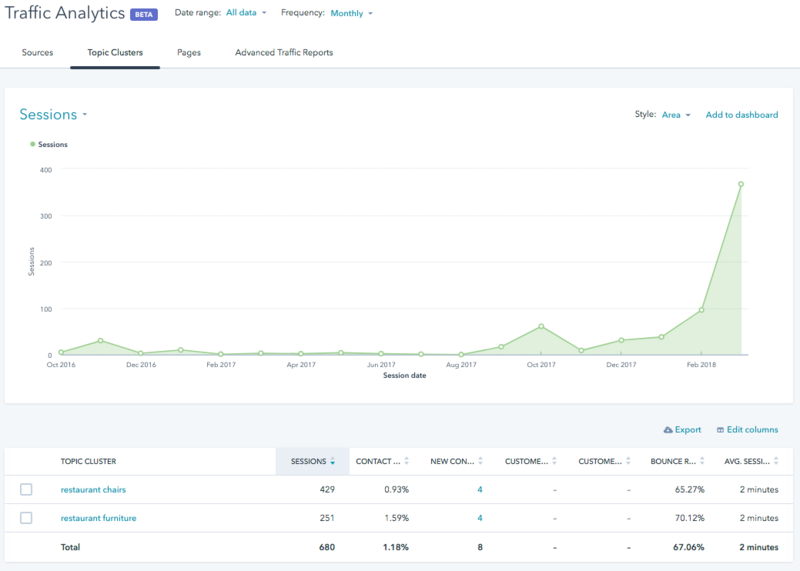 Our content strategy elements went live toward the end of 2018, and already we are seeing some very promising results on the clusters performance as well as an increase in organic search results and contact conversions! We look forward to many more years of continued inbound marketing and sales success with the team at Grand Rapids Chair Company!